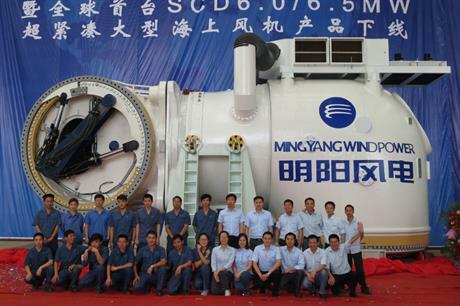 CHINA: Ming Yang rolled a SCD 6.5MW offshore prototype off the production line at its production base in Rudong, in east China's Jiangsu province, on 28 June. The two-blade prototype, developed jointly with Aerodyn, features a permanent magnetic synchronous generator. The machine has been designed for the typhoon environment in China's offshore areas, said Ming Yang. The company was unable to give the length of the blade. In April 2012, Ming Yang signed an agreement with Longyuan Power to install a 6.0MW prototype at the Longyuan wind farm in Rudong. Ming Yang chairman Zhang Chuanwei said that his company would grasp the opportunity of large-scale offshore wind development in China in the next three years. In 2011, Ming Yang won a public tender to supply 16 3MW SCD turbines and engineer, procure, construct (EPC) solutions for the 48MW offshore wind project in Xuwen, Zhanjiang city, Guangdong province. In 2012, Ming Yang won an EPC bid for two 200MW offshore wind demonstration projects located in Zhuhai, Guangdong province.